Zorro is one of the most complex wings I have ever had a chance to fly on. I use the word “complex” not because of any particular issue with take-off or landing or in-flight handling of the wing. It is the character of the wing, which is quite unique, sometimes not really straight forward and I had to “digest” the impressions of flying it before starting writing the review. The reason, which has brought me to the point of testing and flying Zorro from Sky Paragliders is pretty simple. My Apco Lift, which I used for flying cross-country throughout last years has reached 200 hours and the time came to consider something new. My requirements towards the new wing were quite demanding – Fast, Stable and Effective wing with relatively high glide ratio for long cross-country flights sometimes under rough conditions. Top speed is important for me because the best time to fly cross-country with motor is the early morning/late evening and you want to make the most of it using your wing’s top speed. Apco Lift was quite fast, with the top speed of 37mph, delivering uncompromised stability and safety, but was demanding in terms of the thrust needed. 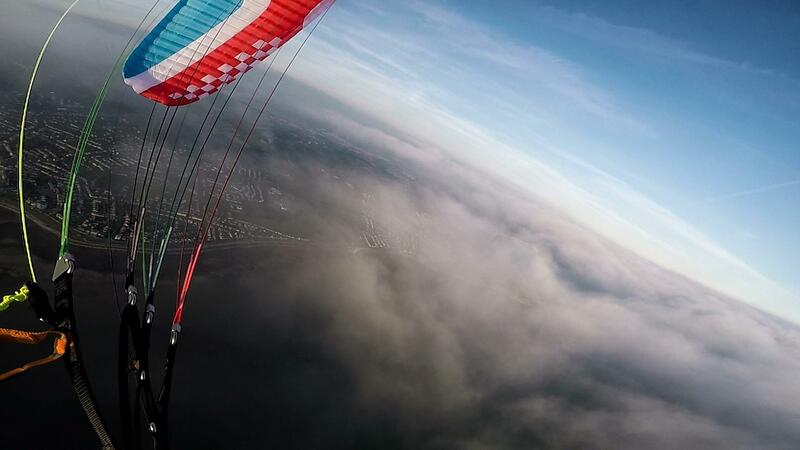 Flying at full speed with My Moster 185, my 20 liters fuel tank was always empty in two and a half hours. To be perfectly honest, I was not expecting a lot from Zorro and therefore I was very surprised with the results of the tests. 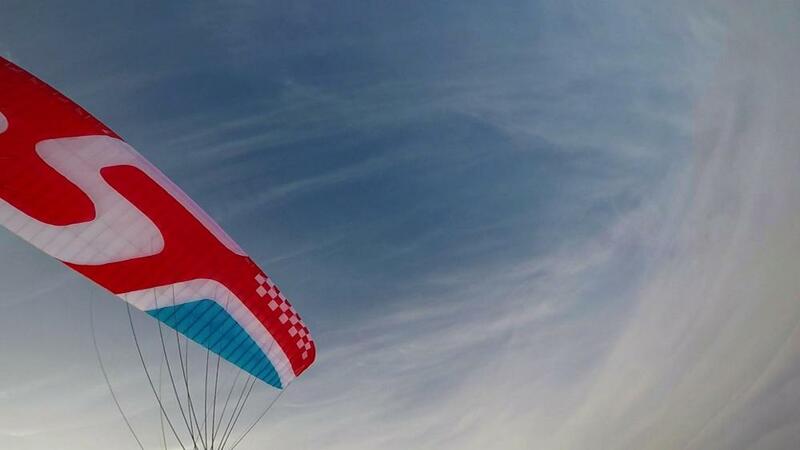 SkyParagliders wings are produced in EU and high quality in not something unexpected. Lines have relatively complex structure with sheathless lines at the top and sheathed mid and low level. Because of this complex top structure you have to check them thoroughly before taking off and to be especially cautious when taking off from the fields with long grass. Risers look pretty simple for 2018, magnets in the brakes could be found only by tiny blue embroidery and I would say the ends are miles away from the leaders of the market. Trimmers are quite thin and tends to loop over the ends in flight. This means that you have to control it (and untangle if needed) before opening the trimmers, otherwise you will end up with one trimmer fully open and one only partially open because of the trimmer stuck. On the other hand, the small brakes are pure perfection. They are wide, have the best possible rigidness, big enough to use three fingers with it. What it means is that you will be very comfortable when steering for a long time. For me it is paramount as most of the time I fly with trimmers off, a lot with the speedbar pressed out and I have to use small brakes all the way round. Big brakes are designed in a very smart way as well. In the upper part of the main brake you find the small cross bar. You can’t even see it when holding the brakes in an ordinary way. But at landing, holding this bar at the top of the brake you can pull the brake 15 cm deeper then when you are holding the lower part of the brake. It makes a real difference because with many fast wings you need to loop the line over the hand to make the landing comfortable. Well done, what else can I say. Speedbar uses high quality pulleys and it is quite easy to operate it and keep the speedbar pressed out for a long time. Take off with this wing is… easy and difficult at the same time. To be honest “difficult” is not a right word here, it is just special. To start from, Zorro is one of the easiest wings to get over your head I have ever tried. If you are not accurate at the start (for example taking off not straight into the wind or pulling one side of the wing more than another) it is very easy to compensate it. The wing has no tendency to overshoot at all which means that when you are doing the rear start it gives you some time to turn and start running as if it is waiting for you to decide on what you want to do next (to fly or not to fly – that is the question). I would say that it is definitely the school-wing level easiness to get it up over your head. And then the fun starts. The wing is fast. Really fast. It’s speed with the trimmers completely closed is 28mph (24m Zorro with my take-off weight of 130 - 140kg). Just to remind, you just cannot run with such a speed, it is not possible. What this means is that you must apply brakes intensively to get the take-off speed down to the level when you can actually take off. Otherwise you will be running to the end of the field with no chance to get yourself up in the air. To sum it all up, taking off with Zorro you have to be prepared to use brakes. As soon as you master it, take-off is easy and smooth. I would say that landing is quite an easy one with Zorro. The only thing is that you have to get the time right when applying the brakes. Otherwise, you will either land with too high horizontal speed (if you apply the brakes too late) or with high vertical speed (if you applied the brakes to early). Before I start describing what particularly you feel when you fly Zorro, I have to tell you a bit about the differences between the reflex wings. You will not find this classification anywhere, but there are two types of reflex wings. I call these two types “sausages” and “planks”. The difference between these two types is how they behave under (heavy) turbulence. “Sausages” would bend, trying to get to U-type shape (to certain extent of course). The good thing about this class is that they absorb turbulence making it more comfortable to the pilot to fly through it. Moreover, flying through the moderate turbulence you even do not need to compensate. Apco Lift of the first and second generation is a typical representative of this class. However, they have less cells and are less effective in terms of glide ratio. Second type, the “planks” keep it’s shape under turbulence which results in non absorbing the turbulence at all. It means that you have to compensate even light turbulence but the wing will be more effective in terms of both glide ration and steering response. I would not argue that some wings bare the traits of both classes but what does matter is that Zorro belongs one hundred percent to the second class. If you are used to fly “hands free” under moderate turbulence conditions with your hands busy with camera then do not expect that you can do the same with Zorro. You will HAVE to compensate. Gentlemen, it is superb, especially with using small brakes. The wing dives into wingovers and spirals as easy as you want it to. However, there is a significant difference between Zorro and few other wings I’ve tested – Zorro is doing exactly what you want, not “overdoing” the command in any way. The space to develop your piloting skills flying Zorro is tremendous. Not even to mention that the wing turns to the side of the engine thrust and against the trust with the same ease. The wing I tested was 24meters and with the load of 130 – 140 kg it is doing 28 mph with the trimmers completely closed, 34 mph with trimmers fully open and having top speed of 41mph with the speedbar pressed out. This gives you the freedom of flying cross-country against quite a strong head wind. And now, coming to the most interesting fact about the wing, it’s behavior under really strong turbulence. Some time ago, when planning the cross country flight in Wales flight I omit the important part of it, I did not check the fronts coming. The weather forecast was showing quite moderate wind but when the occluded front started passing over my head the wind blasts reached 35 miles per hour speed. At the photo below you can see my speed of 122kmh (76 miles per hour) when flying downwind with the speed bar pressed out. Heavy clouds appeared out of nowhere, I was able to see the rain coming and the turbulence became very strong. Being over the mountains I had no chance to land there because of the strong rotor zones developing under such a strong wind. I had about 4000ft of altitude and instead of closing the trimmers and using main brakes to control the wing I decided to press out the speedbar and to try to make it to the place I took-off from. During 10 minutes which it took to get to the landing site the turbulence was absolutely horrendous, the wing was yanking me in the harness extremely hard but the wing stayed rock solid as if it was made of metal, with no collapses or even ears flapping. As a conclusion, I can say that the wing is really safe and shows very solid and stable behavior under strong turbulence. You can also use the speedbar under turbulent conditions. The price for this stability is the comfort of the pilot. In comparison to many other wings, it transfers all the turbulence to the harness. In paragliding, as in all the other areas of your life, everything has a price. Picking up one option you have to sacrifice another one. Picking up very fast wing which is able to fly safe under strong turbulence you are loosing the comfort. Fair enough, that works for me. As for gliding quality, it is pretty effective. With my 24 meters wing loaded at 140kg and flying at top speed of 41mph, my Moster need to deliver 7900 RPM for horizontal flight, which is not bad at all. Surely, the glide ratio is below the best competition wings but the balance of the speed and stability is worth spending extra 0.5l of petrol per hour. I reckon that this wing fits both cross-country and everyday flight purposes. Moreover, following the test I have bought this wing, because I value it’s capability of flying fast under relatively rough weather conditions. Not to say that Zorro is very agile wing and you will be never bored with it unless you decide to specialize in Acro. I definitely would not recommend it as a first wing, or for the pilots who do not fly regularly. Not because of the complexity of controlling it, but just because you have to understand what you are doing with the wing, how it will respond to your inputs. You have to be confident in your take-off and landings and have an experience of active piloting/flying under turbulent conditions. If you match this profile, this wing will give you an opportunity to progress further, to develop your piloting skills and to enjoy our beautiful sport. PS Following the test I made the dicision to buy the test wing and started using it as a main wing for cross country flights.